Rae began her yoga practice when she was a teenager. On a whim, she took her first class and that was it for her. She immediately felt something new: true relaxation. Since that fateful class, she knew she wanted to help people find the same happiness she found in yoga. Rae trained at BODY of Santa Fe in the Spring of 2013 and has been teaching ever since. She has since trained at Elements in Darien, CT and Wanderlust and Yoga at the Raven in Los Angeles. She currently lives in LA with her cat (and unfortunately no goats). Certified Vinyasa Yoga Instructor, Tiffany Alice teaches a joyful practice of slow flow yoga suitable for all levels that ultimately engages focus, activates curiosity and energizes the Self. Certified Yoga Instructor, Jocelyn Yamasaki, encourages her students to have fun while exploring the benefits of connecting mind, body and breath awareness. An especially good class for first-timers. Mhairi has been a yoga practitioner for over 20 years and has been fascinated with movement her whole life. Since moving to Los Angeles from London 8 years ago she has trained as a yoga teacher at Hollywood Power Yoga and enjoys teaching throughout LA. 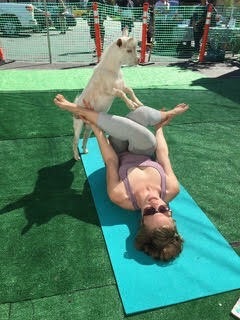 She is also a classically trained mime and clown and brings a lightness and a sense of play to her classes and with that in mind is delighted to be teaching with goats, the ultimate reminder to smile and to enjoy the practice of yoga. Emily's classes utilize thoughtful, creative, and playful flows to increase conscious movement, awaken and energize the mind and physical body, and invite experience. Combining attention to alignment and encouragement of self expression, Emily’s classes provide the space to check in, face challenge, have fun, and work through. Mixed levels welcome! Through Elisa's personal practice, she has come to know the many benefits of yoga, both physical and spiritual. Her practice has helped her grow stronger, healthier, happier, more flexible and fearless, both on and off the mat. She is grateful for these gifts and has been inspired to share them with others by teaching yoga. Yoga has the capacity to challenge and stimulate any and every student. Elisa is inspired by and experienced with yogis of all levels and is honored to share the transformative power of yoga with anyone who is eager to discover the joy and peace of practice.